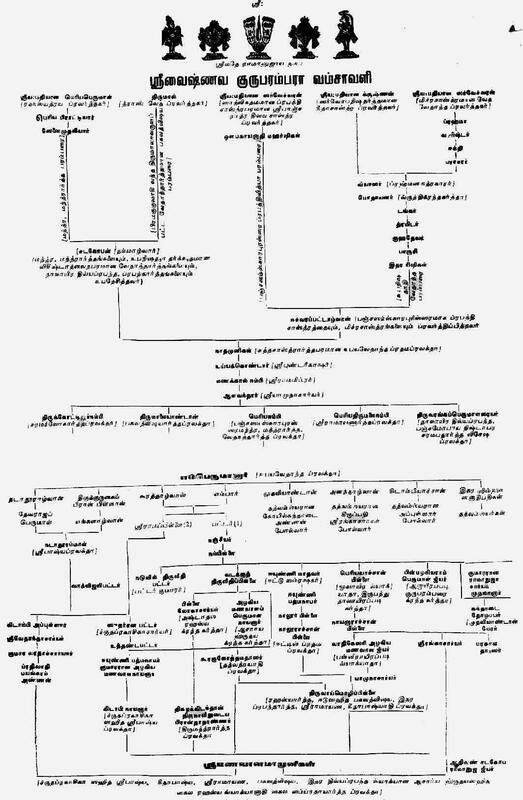 a detailed family tree of namperumanar and acharyas .Till now i was in dark but for some extent i know but not like this As a vasishnavan we should know the immedoiate acharyan and their ancestors like Gure paramparai . not sure about the availability of this AchArya’s thaniyan. adiyen is not sure if veeravalli is AchArya purusha – will check and let you know. Adiyen maduramangalam kanthadai srinivasavaradhan ramanuja dasan. After retirement from service now place of residence villivakkam chennai. My pranams to H.H. Peri a Kelviappanswami Swami, TIrumala, adiyen’s acharyan. Varadachariar swami at villivakkam our Prabhandham Acharyan. Our pranams to Varadachariar swami also. There is a trio, Parthasarathy swami, venkatesan swami and sundararajan swami, deeply committed to Bhagavath bhagavatha Kainkaryam in villivakkam. I am trying to follow them. How do you prove that krishna is paripurna in vishistaadvaita?…..
but ,according to vishistaadvaita…we are brahman,at the same time ,we are not paripurna…similar case applies to krishna…so,how is krishna paripurna in vishistaadvaita? Looks like you are confused. The questions are un-related to this particular page. visishtAdhvaitha is one of the ancient philosophies presented by many saints and was accepted as the main foundation of srIvaishNava sampradhAyam. bhagavayh gIthA is one of the literature that is accepted as pramANam (authentic source) in this philosophy. So, what is said in bhagavath gIthA is fully accepted in visishtAdhvaitham which includes bhagavAn as paripUrNa (full) in all aspects as well. visishtAdhvaitha does not say “we are brahman,at the same time ,we are not paripurna…similar case applies to krishna” – this is your own words. I welcome you to study visishtAdhvaitha under learned scholars to get a good understanding of it before jumping into conclusions. He is very much in our guru paramparai. If you are specifically asking about OrAN vazhi guru paramparai – these are the leaders of the sampradhAyam – one who carried the torch in succession. Many stalwarts like AzhwAn, ANdAn, periyavAchAn piLLai, vEdhAnthAchAryar, etc., are not in OrAN vazhi guru paramparai. From 3:30 pm till now [7:58pm] i went through the Oranvazhi acharyans, azhwars and other acharyans details. Thank you for the immense research you had carried out in this sphere. Will it be possible to find out about other acharyans who have established during the age? For instance Doddayachars, Jeeyars of Tirukkovalur, acharya at Brundavan who also manages the south indian style brundavan koil, et al. Also would it be possible to get the samayam [time period] of the published acharyans and azhwars so that I could straighten my record? thanks for the detailed observation/comments swamy. we do have some more information in few other websites maintained by sishyas of specific mutts/thirumALigais (like thirukkOvalUr jIyar, doddAchAryar, etc). Regarding the time period – its little bit difficult to trace many of the AchAryas, but adiyen shall try time permitting. OrAN vazhi AchArya paramparai is the guru paramparai where the leadership is passed on from one person to another – starting with periya perumAL to maNavALa mAmunigaL. Though there may be multiple AchAryas prevalent at a particular time, a leader would preside over the sampradhAyam at that time. After mAmunigaL, the concept of single head of the sampradhAyam disappeared and multiple mutts/thirumALigais became prominent. Please see #39 vEdhAnthAchAryar – his vaibhavam is fully documented in that page. ஒரு சிறு சந்தேகம். எம்பெருமானார் ஏன் 74 சிம்மாசானாதிபகளை நியமித்தார். அதை ஏன் ஒராண்வழியாக ஒருவரிடம் கொடுக்கவில்லை. இந்த 74 பேருக்கு நியமித்த பணி என்ன? அவர்களுக்குக் கீழ் ஆச்சார்யப் பரம்பரை உருவாக்குவது எம்பெருமானாரின் நியமனப்படி கிடையாதா? கொஞ்சம் தெளிவு பெற உதவும். Previously (upto emperumAnAr’s time), it was coming down in OrAN vazhi only (where very few qualified people would be accepted into the sampradhAyam). emperumAnAr, out of his great compassion, established the 74 simhAsanAdhipathis, and directed them to share this great knowledge to everyone who is interested to learn. The OrAN vazhi AchAryas remained as the leader of the sampradhAyam during their times, yet, there were many AchAryas who actively spread the sampradhAyam in the nooks and corner of our bhArtha dhESams which is why we are seeing the presence of SrIvaishNava mutts and followers in the whole of our country, from North to south and from east to west. The purpose of these AchAryas is to spread the knowledge, accept Sishyas and develop those Sishyas to be very good SrIvaishNavas and continue the chain forever.